News - Page 2 of 50 - Mulzer Crushed Stone, Inc. News - Page 2 of 50 - Mulzer Crushed Stone, Inc. The following article by G.C. 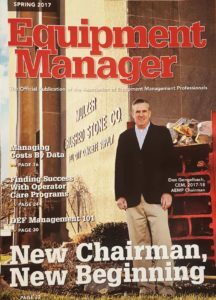 Skipper was featured in the Spring 2017 edition of Equipment Manager, the Official Publication of the Association of Equipment Management Professionals. Don Gengelbach’s career that led to his earning a CEM and, most recently, being named AEMP’s chairman for 2017, started when he was a youngster working as a farm hand in Indiana. 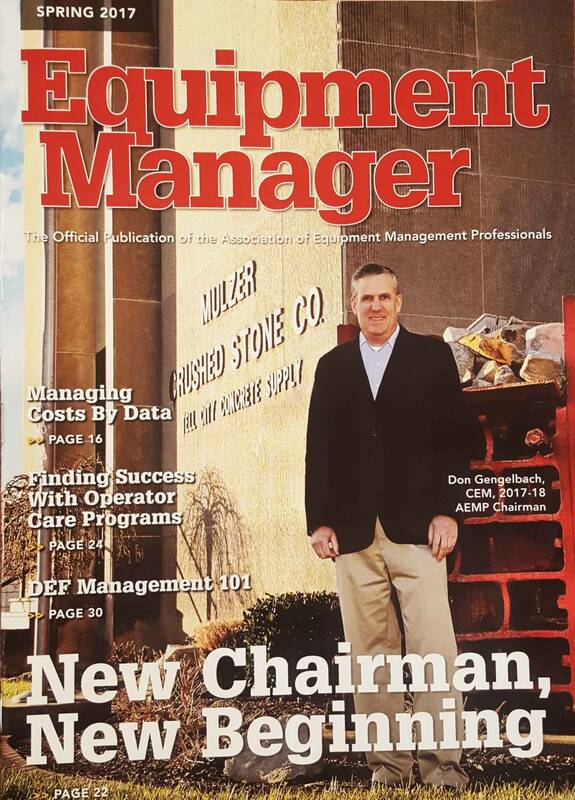 As he begins his term as AEMP chairman, Gengelbach also continues his responsibilities as equipment manager for Mulzer Crushed Stone, Inc. (MCS), a company headquartered in Tell City, Ind. During his 35 years there, he has expanded, improved, and developed the different skills required to succeed with each of his promotions. He started at MCS as a welder unti la diesel mechanic position became open. After that, he became a quarry production supervisor, and then assumed the responsibilities of fleet manager for the company. With MCS, he has learned how to recruit new talent, and, more importantly perhaps, he learned where to find the skills required from his early days of working in the shop. “Although technicians were plentiful in 2000, MCS had already established a program to find future employees,” Gengelbach says. “They dipped into a pool of candidates who wanted not just a job, but a career. The recruitment program, which was set up prior to 2000, works closely with area local educators to get high schoolers introduced to the company’s maintenance operation. In recent years, MCS has expanded the program to include welders and electricians. 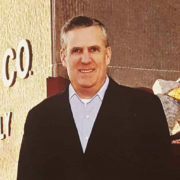 Gengelbach says the company is also communicating with more age groups. It’s not surprising, then, that the focus of his incoming AEMP tenure reaches across three fronts. “I want to continue with a strategic plan that focuses on safety, technology, and workforce developement, wiht a little bit more emphasis on developing the workforce. 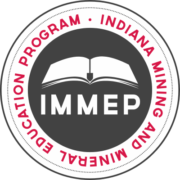 All three of my priorities flow into the very reason why AEMP was formed – namely, education. Right from the beginning, education was one of the most important drivers behind creating the association,” he says. Noting that the existing Workforce Development Committee, which is only one year old, “is off to a great start” communicating with training centers, trade schools, and community colleges to encourage students to look beyond today’s obvious career paths, he would like to see it develop a structured career path. He says more and more graduates will discover career choices that they might not know about in the heavy equipment industry. Gengelbach, who served on the Online Education Committee, intends to push forward with aggressive efforts to get more AEMP members involved in committees. Career-wise, he knows firsthand what the industry has to offer. After high school, he enrolled in a trade school to learn to be a diesel mechanic. his experience and background repairing farm equipment proved to be a strong foundation to build on, Gengelbach says. His first supervisory role at MCS came during the late 1980s when he left “mechanic row” and moved to a new quarry that MCS had acquired. That meant a location change, but he didn’t hesitate. He moved about 90 miles from Perry County, Ind., to Clark County, Ind. “that put me into a position to become production supervisor of that quarry,” he says. Immediately, Gengelbach, with others, tackled major modifications to the quarry itself, making sure the new facility lived up to MCS’s standards. It was toward the end of the modification process that he was asked to become the quarry’s product supervisor. In 2000, he was offered an opportunity to move back into maintenance. He accepted, knowing he had to learn yet another set of additional skills to handle the duties of equipment manager. But to succeed in his climb up the career ladder meant much more than simply on-the-job training. MCS, he says, has always encouraged its maintenance employees to become active participants at the community, regional, and national levels by joining associations and groups that could help them improve and better understand their jobs, among other things. “The company is a strong supporter of AEMP,” he says. He heard about AEMP through a former MCS manger and started attending local chapter meetings. Impressed with the group and how it could impact his career in a positive way, he became an AEMP member in 2005-2006. Among the benefits that AEMP membership has given him is how to use his own experience, combined with intense study and preparation, to become an AEMP Certified Equipment Manager. Another comes from attending the conferences, where attendees are taught ways to do the job more efficiently and ideas are suggested for consideration to help make the job easier and more professional. That not only is true for the meetings, panel discussions, and sessions themselves, but also for the meaningful takeaways from discussions with other members. Despite the wide spectrum of challenges, Gengelbach says he has found solutions that he can apply to his own operation. “The first thing that comes to mind is that we all have to manage life cycles,” he says. “Also, we all use technology to identify the different types of equipment in our fleets. 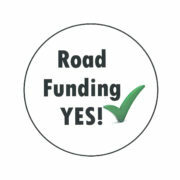 Everyone, for example, has to set up budgets and make decision on whether to keep equipment or replace it. 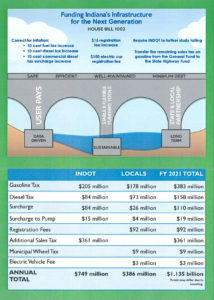 As House Bill 1002 moves to the Indiana Senate, we hope that its fair, user pays based approach continues to get support and the bill is able to move to the Governor for his signature. Mulzer Crushed Stone, Inc. would like to extend a genuine thank you to all the Area Representatives who supported this bill and have put Indiana’s drivers and truckers at the top of their agenda. 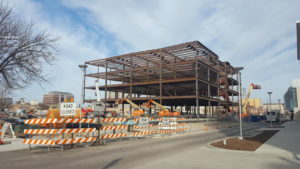 Evansville, Indiana – Downtown Evansville has been buzzing with the sounds of construction, notably on 5th Street at the site of the future IU School of Medicine – Evansville. Beneath the towering steel beams recently set on the site, a considerable amount of crushed limestone from our Crawford County, Indiana quarries can be found underneath and in the surrounding areas. We are looking forward to seeing the facility come to life in its journey towards completion, expected at the end of this year. 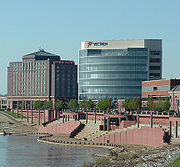 There are many exciting things going on in Downtown Evansville and we’re thrilled to be a part of it. Steel is up on the IU Medical Center Evansville. 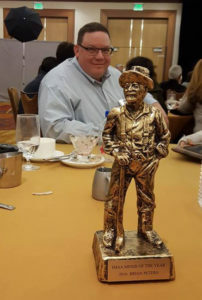 Indiana Mineral Aggregates Association (IMAA) has named Mulzer Crushed Stone, Inc. Environmental Health & Safety Director Brian Peters the organization’s 2016 Miner of the Year. Nominations for the “Miner of the Year” Award come from Indiana Mineral Aggregates Association members. Individuals nominated for the award exemplify the very best in their profession and continually bring credit to the industry and their community. Selection criteria for this award include significant contributions to the aggregates industry by providing a safe working environment; being innovative in problem solving; demonstrating a concern for the environment; and contributing to the betterment of their local community. 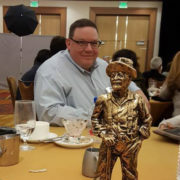 Congratulations to Brian on receiving this prestigious commendation and the efforts he has dedicated to help create a safe working environment at our company, his continuous concern for the environment we live and operate in and the countless hours he and his family devote to the prosperity of their local community.